A Deeper understanding of the Benefits of Fish oils: Why sourcing, quality, and purity matter. Fish oils are one of nature’s sources of eicosapentaenoic acid (EPA) and docosahexaenoic acid (DHA) omega-3 fatty acids which are further characterized as long and very long polyunsaturated fatty acids or (PUFAs) respectively. These lipids are key components of cell membranes and brain tissue and are often lacking in standard American diets. Humans have limited capacity to endogenously produce EPA and DHA and thus they are considered essential fatty acids, and sufficient amounts need to be obtained from food sources or supplementation*. EPA and DHA are occasionally referred to as marine lipids since they are reliably sourced from fish and have many functions in the body. DHA is in high concentration in the retina and in the brain. To obtain the health benefits of fish oil there are a few difficulties to consider. Firstly, what amount of fish would be needed daily to obtain an optimal daily amount of omega 3 fatty acids? According to guidelines set forth by the Mayo Clinic, therapeutic dosages range between 2.0-8.0 grams of fish oil with specific ratios of EPA: DHA amounts depending on which body system needs support.1 This means to obtain this from diet alone, a daily consumption of 8-12 ounces of salmon (a rich source of EPA and DHA) would be required to obtain many of the researched health benefits of fish oils. This amount would be difficult and expensive to consume on a daily basis. For this reason additional research on the benefits of supplemental fish oil are being published.2 This leads to other questions including the questions of sourcing, sustainability, purity, and stability of supplementation. Lastly, many companies who produce finished goods dietary supplements containing fish oils use refinement techniques to decontaminate the oils. These include processes such as stream stripping and heat distillation, and often leave them vacant of many of the constituents that provide fish oil benefits such as higher levels of EPA and DHA. It is important to look for fish that were sourced sustainability and processed efficiently. Fish undergo rapid oxidation, which can counteract the health benefits of fish oil. The “fishy” smell and taste are not normal and can indicate that the fish oil has already begun to oxidize. Bear in mind that omega-6 fatty acids, such as fats found in corn oil, vegetable oil, and most processed foods also play a role in the amount of omega 3 fatty acids available for use in the body. They directly compete with omega-3 fatty acids and the benefits of fish oils. Lowering overall consumption of foods high in omega-6 fatty acids is recommended. The list of fish oil benefits is extensive and well researched. Some of the most important questions to ask when looking for a reliable supplementation for these essential nutritional oils are about the purity, quality, and source of the fish they have been obtained from. 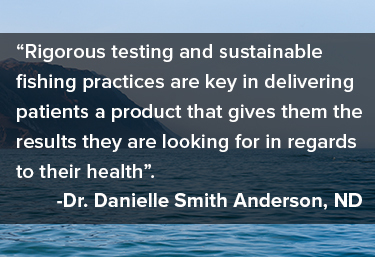 Rigorous testing and sustainable fishing practices are key in delivering patients a product that gives them the results they are looking for in regards to their health. These mindful sourcing practices ensure high quality marine sources of omega-3 fatty acids for generations to come. Danielle Smith Anderson, ND, M.A., L.ac. Dr. Danielle Smith Anderson is a naturopathic physician and acupuncturist in Portland, Oregon. She is the owner of terrainwellness.com, an integrative medical clinic that focuses on restoring and re-balancing the body to treat chronic ailments. She has a passion for educating the public on the effective use of natural medicine. She also co-owns a sparkling herbal tea company called Doctor Bird Elixirs. She co-hosts The Resourced Adult an online radio show about natural living, authentic relationships, humor and parenthood. Drugs and Supplements: Omega-3 fatty acids, fish oil, alpha-linolenic acid. http://www.mayoclinic.org/drugs-supplements/omega-3-fatty-acids-fish-oil-alpha-linolenic-acid/dosing/hrb-20059372 Published November 1, 2013. Accessed Feb 12, 2018. Siscovick DS, Barringer TA, Fretts AM, et al. Omega-3 Polyunsaturated Fatty Acid (Fish Oil) Supplementation and the Prevention of Clinical Cardiovascular Disease: A Science Advisory From the American Heart Association. Circulation. 2017 Apr 11;135(15):e867-84. Safe SH. Polychlorinated biphenyls (PCBs): environmental impact, biochemical and toxic responses, and implications for risk assessment. Crit Rev Toxicol. 1994;24(2):87-149. Guallar E, Sanz-Gallardo MI, van't Veer P, et al.Mercury, fish oils, and the risk of myocardial infarction. N Engl J Med. 2002 Nov 28;347(22):1747-54. Lavoie RA, Jardine TD, Chumchal MM, Kidd KA, Campbell LM. Biomagnification of mercury in aquatic food webs: a worldwide meta-analysis. Environ Sci Technol. 2013;47(23):13385-94.